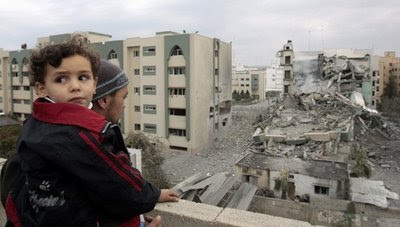 A Palestinian child observes the aftermath of an Israeli air strike on the Islamic University on Gaza. Israeli civilians take cover after an air raid siren sounds in the city of Ashkelon. 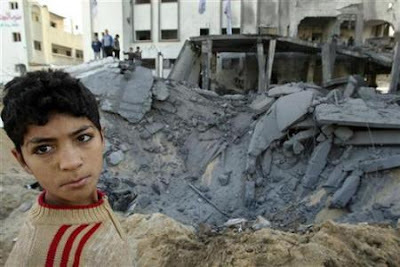 A Palestinian boy surveys the devestation caused by an air strike. The Israeli Air Force have released the following graphic video of an air strike in which several men are killed while apparently loading a pick up truck with Kasam rockets. The following footage shows the Israeli Navy launching attacks against the Hamas coast. Watch the chaotic and bloody aftermath of an Israeli strike. 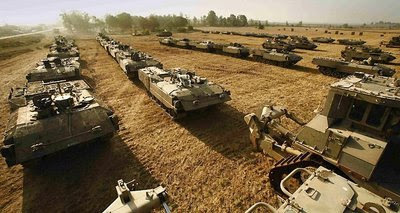 I believe that the IDF have now sent ground forces into the Gaza strip as the next phase of operation Cast Lead gets underway. Although this has not yet been announced nor have the mainstream media reported it I believe it to be the case. I have come to this conclusion after monitoring several Israeli blogs where family members have received text and emails from soldiers at the front. It does however remain to be seen whether it is a large scale incursion July 06 style or a more delicate incision by special forces. I believe that this latest phase in the Israeli Palestinian conflict is political in nature. Many commentators have picked up on this point but I think it is sound reasoning. I have posted regularly on Gubu World about the upcoming February elections in Israel and how hardliner Benjamin Netanyahu is expected to return the Likud party to power at the expense of the ruling Kadima party. Netantahu is running on a hawkish line, constantly criticising the Livni/Olmert government of being too soft on Hamas, Hezbollah and Iran. With six weeks to go until the election it is difficult not to make a connection between the internal power struggle within the Jewish state and the air strikes we are witnessing. If the IDF do inflict a decisive blow against Hamas it will be a massive electoral blow to Likud and for Netanyahu's ambitions to become Israeli Prime Minister for the second time. Perhaps the current Israeli government's biggest failure in the eyes of its people as Netanyahu constantly reminds the public, was their failure to respond effectively to the Hezbollah challenge in the summer of 2006. However it would appear that that conflict is shaping up very different to this. The July 06 war was stared on Hezbollah's terms and the IDF never really got to grips with it. But the conflict this week was initiated at a timing and in a method of Israel's choosing. Hamas are losing this. This time it appears that it is them who are unprepared so I am predicting at this early stage that the outcome will be very different. I will keep you posted as best I can. As of now the death toll stand at 3 Israelis and 338 Palestinians. It has been brewing for some time but all out war has broken out between Israel and Hamas in the Hamas controlled Gaza strip. On Saturday the Israeli Air Force launched a bombardment of the Gaza strip. By Monday lunchtime it appears that two Israelis have been killed by rocket fire in the southern city of Ashkalon and 315 Palestinians have been killed by the strikes. 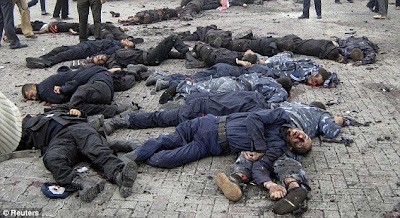 Of these at least 60 were civilians. The rest were Hamas policemen and officials killed when the IAF attacked the Islamic university and a Hamas government compound. It is also being reported now that the Israeli Navy are participating in the attack on Gaza with warships in the Mediterranean firing shells at Hamas targets. Speculation is rapidly mounting as IDF troops gather at the southern border and army reservists are called up that an all out ground offensive is only a matter of time. Irish Minister for Foreign Affairs Michael Martin has condemned the Israeli air strikes as disproportionate. British foreign secretary Davis Miliband has called for an immediate ceasefire as has Middle East peace envoy Tony Blair. The Americans have urged the Israelis to do everything possible to avoid civilian casualties. There are vocal demonstration appearing outside Israeli embassies all over Europe including Dublin. Israeli flags are being burnt in angry scenes in Muslim cities from Baghdad to Jakarta. There are also reports of riots in Tel Aviv and Jerusalem by Arab Israelis angered at the Gaza attacks. In the West Bank the Fatah Palestinian President Mahmoud Abbas has expressed his solidarity with his rival Hamas in the face of the Israeli onslaught. It has been a slow month for Gubu World but it now looks like the political blogosphere could be very busy with this for the next month or so. Is this a re run of the July 2006 Israeli war with Lebanon. In any case I will try to keep my readers as up to date as possible by regularly updating on events whilst also posting on the context and background of the conflict as well as as examining the morality of the conflict and the methods used by both sides. Stay close ! 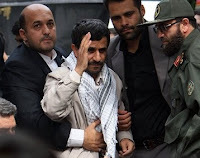 On Christmas day Britain's Channel 4 news broadcast a Christmas message from Iranian President Mahmoud Admadinejad. Not surprisingly this has been met with outrage by Israel, world Jewry and Iranian dissidents. The basic theme of his address, directed at the British people is that the vast problems facing humanity today could be resolved if world leaders and humanity itself followed the teachings of the prophets. Watch yourselves and tell me what you think. In one way his Christmas message appears conciliatory as he heaps praise on Jesus Christ in particular and urges people to follow his message and that of the Jewish prophet Abraham. However the bit that worried me was when he began talking of the second coming of Christ and Mohammad. This to me gets a little too close to all the "end of days" talk that Christian Zionist fanatics and Muslim extremists love to rant about. I like most reasonably minded people do not want to see all the land between the river Jordan and the Mediterranean returned to the Jewish people so that the second coming can be sped up in the wake of the resulting Armageddon. I say put the Iranian fundamentalists and the Christian Zionists on an island somewhere and let them have their Armageddon, just leave the rest of us out of it. As for the controversy surrounding their decision to air the speech. It was ten times the entertainment that the Queens speech offers so I'm down with it. Here is a big thank you and Happy Christmas to my more than 2000 visitors on Gubu World since its creation in May. Attached is without a doubt the best and my favourite Christmas song and video. It is of course the wonderful stop the cavalry. Enjoy. I had a very interesting conversation with a friend of mine recently. I went to college with this lad and I can tell you he is a smart punter. But check this out. Halfway through our chat in a city center pub the subject of Israel came up , no doubt brought up by me. I don't ever recall having a conversation with this man about the politics of the Middle East before but I was astonished by what came next. Those Israelis are bastards aren't they my buddy claimed. Nothing too shocking there for that does be the general consensus about college campuses and radio talk shows. But my friend then went on to admit that he knew virtually nothing about the Israeli state. He did not know that it is the world's only Jewish state. In fact, he thought it was an Africa country. And there in is the problem. How could a person know so little about a country yet hold such a strong opinion. OK, politics has never been this guys thing but still, alarm bells are ringing. I have Israeli and Jewish friends that are utterly convinced that the motivation behind the intense anti Israeli rhetoric that we see throughout the land is a covert form of anti semitism. There have been times when I have struggled to find a suitable argument to dispute this. But then it struck me. The vast majority of the world's population are politically inattentive. And a large percentage of those that are attentive are lazy minded. For such people, all they see is the following: About 20 times more Palestinians than Israelis have died in the conflict since the outbreak of the second intifada in 2000. The Israelis have an overwhelming military superiority. Israel is a first world country where as most Palestinians live in abject poverty. These facts are undeniable and for the lazy minded no further debate is required on the subject. As my friend says, the Israelis are bastards and that's it. Having said that I did successfully turn my friend around and that is what I intend to do here at Gubu World whenever I can. I do not simply want to defend Israel in a meaningless way. But I will confront and expose badly informed Israel bashing and instead try to initiate rational discussions on the Israeli Palestinian peace process. I will have plenty of opportunity throughout 2009 to do this as the 2002 Saudi inspired peace plan, backed up by Tony Blair and his team looks set to burst on the scene early next year as it appears the Obama administration is keen to prioritise it from the outset. Interesting times ahead. As I'm sure you have all seen by now an irate Iraqi journalist hurled his shoes at President Bush while he was giving a press conference in Baghdad alongside Iraqi Prime Minister Nouri Al Maliki. Entertaining stuff. I thought this prez was supposed to be slow but he moved fairly quick in this instance to his credit. Faster reflexes than I would have guessed. Bush was in Baghdad to officially sign the new security pact which permits US forces to stay in the country until 2011. The controversial agreement was backed by the political establishment in Iraq with the exception of Moqtada Al Sadr and his militant Shiite followers. I will post on the ramifications of this development in the very near future. In the meantime watch the clip of the shoe hurling incident. I had to use the fox news clip because you're always guaranteed an extra portion of crassness. Enjoy. I was in a nightclub a few nights ago and the duelling banjos tune from Deliverance came on. Strange one I know but it led to me describe to a friend my favourite scene in a movie which is the duelling national anthems between the French and German soldiers in "Rick's Bar" in Casablanca. Its a patriotic battle of song between the somewhat confused Vichy French soldiers of North Africa and the visiting Germans. Hence why the French need to be prompted by Victor Laslow, the British anti fascist activist. Enjoy this piece of cinematic genius. I believe further elaboration is required on the subject of my last two posts. 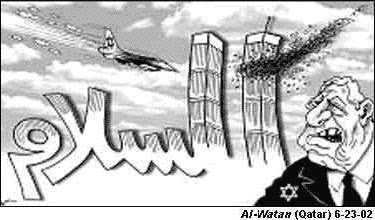 Why do many people, particularly in the Arab world believe the racist conspiracy theory that there were no Jews killed on September 11th. Anti Semitic people that buy into the protocols of elders of Zion theory which basically claims that world Jewry are strategically placed throughout the world and that they are pulling the strings to further the Jewish agenda also tend to mouth this claim that there were no Jewish victims of 9/11. 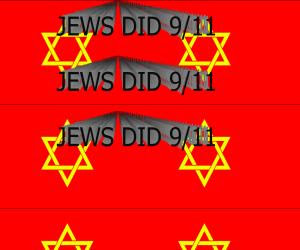 So basically the Jews knew about 9/11 in advance and consequently none of them showed up for work that day. This is of course not true. There were nearly 200 Jewish people killed that day. But this undeniable fact doesn't stop many Muslims believing this theory. It really is quite sinister as the message underpinning it is that Jews around the world are working to strengthen Israel and to destroy the Arab world and in order to do this they would conspire to organise the 9/11 attacks which empowered Israel to conduct its war in Palestine more aggressively and initiated a chain of events that included the wars in Iraq and Afghanistan. The Jews created aids. This ugly rumour is particularly popular with sub Saharan Muslims. They have got in into their heads that the Jews invented the HIV virus in order to combat the increasing Muslim population in Africa. Jews caused the 2004 Asian tsunami. Apparently it was not an underwater earthquake. It was in fact an Israeli submarine conducting a nuclear test. And of course they tipped of all Jews not to go holidaying in Thailand of Sri Lanka that day. Some people have been asking me to elaborate on my last post. So here it goes. During my time living in the United Arab Emirates here are some of the random anti Semitic rants I came across, none of which can reasonably be blamed on the Israeli occupation of Palestine. The most common: There were no Jews killed the 9/11 terrorist attacks. The most Bizarre. Aids was created by the Jews right ! My favourite: Did you know the Asian tsunami in 2004 was caused by the Jews. There are many people fighting Israel today not because they are angered at the separation wall or the settlements. They are doing so because a Jewish presence in Palestine is intolerable for them. 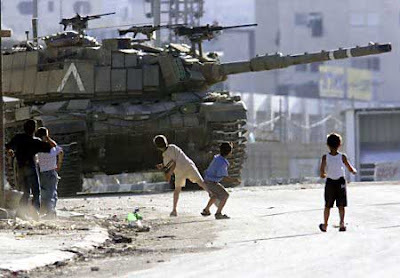 They do not want to liberate Palestine. They want to destroy Israel. As far as they are concerned Tel Aviv and Haifa are settlements that should be dismantled. Many of these people simply will not let go to the dream that they will one day be in a position to deliver a final fatal knock out blow to Israel. During my time in the UAE the most frightening thing I ever heard was, after 100 years of fighting we finally ousted the crusaders from Arab land, the Israeli crusade is only 60 years old. This comment signals the intent of a significant minority of Arabs to never accept a Jewish state.